Shirley Farmer Steele Perkins, a rich attorney, lived at Moat House, which he had inherited from his father-in-law, Joseph Duncumb. Commenting that the intellectual society of Sutton reached its zenith in the 1830s, Riland Bedford, in his “The Rilands of Sutton Coldfield”, mentions several local scholars and authors, including, at Moat House, Miss Steele Perkins writing her elegant and polished verses. Flora and Pomona’s Fete, published in Birmingham in 1834 by Bielby, Knott and Bielby was a popular success, running to a sixth edition in 1838 - a slim volume of poetry with hand-coloured illustrations, a copy recently sold at auction for £100. The flowers attend a fête - “Whilst Lavender stood at the front of the door, / To keep order, and take all the tickets they bore: / And a troop of fine Dahlias placed in a row, / On each side of the tent, made a very bright show.”. Elizabeth Steele Perkins’ other publications were Elements of Botany and Elements of drawing and flower painting. Richard Holbeche commented “Mr. 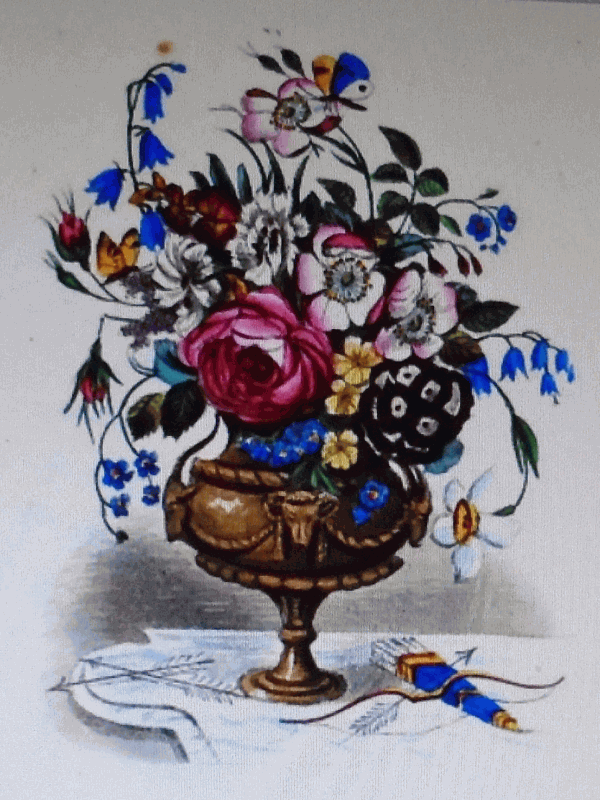 Perkins and his daughter seemed very reserved people”, while his aunt Sarah Holbeche hardly mentions them - reading between the lines, she disliked them - remarking that at the 1841 Walmley Bazaar “Miss Perkins was there with her Floral Fete and her cupids”. Old Mr. Perkins died aged about 86, and in September 1857 Miss Perkins moved to The Cottage. According to the 1861 census, she was a landed proprietor aged 63, her housekeeper was Sarah Fairbrother, who was married to Henry Fairbrother, a journeyman tailor described as “boarder”, with a kitchen maid and a groom. The Cottage was a gentleman’s residence built earlier in the century by Francis Beynon Hacket of Moor Hall. Hacket inherited his estate in 1810, and had big ideas for improving it. Having provided Moor Hall with a new frontage in the Regency style, he turned his attention to the Cottage Estate and built a retreat or hunting lodge on the site of an old ruin in a secluded spot near what is now Mulroy Road. F.B.Hacket’s expectations of inheriting a fortune from his brother came to nothing, and his lavish expenditure resulted in heavy debts, leading him to sell the Cottage Estate to Samuel Smith. Smith died in 1829, leaving his estate equally to his children, and the cottage continued to be leased out to a succession of wealthy tenants for the next sixty years - in 1881 it was occupied by George Moore, a Birmingham brassfounder, with his wife and nine children. Then in 1884 the Cottage Estate was sold to another Birmingham brassfounder, Mr. William Henry Tonks, who lived at a large Georgian house in Lichfield Road called the Rookery (the Police Station now occupies the site). The purchase was quite complicated, as the descendants of Samuel Smith who had a share in the ownership had to be identified - it turned out that there were four equal shares, valued at £930 each. Anchorage Road was being developed in the 1880s, and Tonks probably bought the estate with a view to the handsome profits to be made in the sale of building plots to rich clients, but nothing had been done when J.G.K.Norris bought the estate from him in 1906 - soon after, Mulroy Road was laid out and development began. One of Elizabeth Steele Perkins’ flower paintings used to illustrate “Flora and Pomona’s Fête” - painted at Moat House?